We’d love your help. Let us know what’s wrong with this preview of Life Sentence by Kim Paffenroth. To ask other readers questions about Life Sentence, please sign up. I'm sure this is as good or even better than the first, but I think I'll wait to pick it up until it is re-issued with a better cover. Hands down, the best zombie book I've ever read. Intense from start to finish. Kim Paffenroth is truly a master writer. Kim Paffenroth has gone beyond what he did in his first zombie novel in many ways and in many different directions. I am both pleased and disturbed by this book, which I guess is to say that I both enjoyed it a great deal and yet was exasperated by it. But then again, so few books do that, I consider that to be a good thing. The plot is as different from the traditional zombie tale as you can get, with two parallel storylines. We see the world through the eyes of Zoey, a young girl who lives in Kim Paffenroth has gone beyond what he did in his first zombie novel in many ways and in many different directions. I am both pleased and disturbed by this book, which I guess is to say that I both enjoyed it a great deal and yet was exasperated by it. But then again, so few books do that, I consider that to be a good thing. The plot is as different from the traditional zombie tale as you can get, with two parallel storylines. We see the world through the eyes of Zoey, a young girl who lives in a community that believes it is the last of its kind on earth, with the living having come to terms with the undead that surround it. She is on the edge of becoming an adult and taking on new and more challenging responsibilities. We get to see her perspective change as the world around her changes, expands, and also contracts in many ways, tightening and wraping itself around her as she comprehends more of it, both the good and the ugly. We also see the world through the eyes of Truman, a incredibly rare zombie that has retained much of what he once was when he was alive. Unlike nearly every other rotting stiff that dominate this world, he has a understanding of what he is and how he is different from the living. His intelligence is essentially the same as it once was though he is limited by his deteriorated body. Despite that, he is able to adapt and learn, not only about who he has become but what it means to be a human being, as he is exposed to more and more of them. Their two stories intertwine as each character grows and transforms into something more than what they once were. Both characters start out filled with questions. In the end, they still have many questions but their experiences also grant them some knowledge, not only about themselves but of everyone else around them and perhaps of their purposes in the world. It is hard for me to say I am actually fond of the idea of a intelligent and more importantly, sensitive and humane zombie. Perhaps this is because I already feel that zombies, at least the traditional Romero archetype, are not necessarily evil. They do what they are driven to do by instincts more powerful than anything else. Leave the evil up to us humans, who have the intelligence to perpetrate actual evil quite readily. Devious, diabolical evil. Truman not only resists what drives all zombies but he also does not have the drives and hungers that make humans what they are either. Given this lack of human needs and urges, he becomes almost transcendent. He is sincere, kind, caring, and has no distrust of his fellow zombie. He can feel love but not pain or the burn of sexual desire. He can ruminate on how wonderful and terrifying the human animal can be yet at the same time feeling guilt for what he is, despite the fact that he has done very little wrong in his entire existence as a zombie and certainly nothing wrong outside of defending himself from the hatred and fear of others. Dr. Paffenroth has created a new variation on Bub, the zombie featured in the movie "Day of the Dead". But the difference here is that Bub slowly learns how to become human again--he learns how to appreciate friendship and communication but at the same time the idea of revenge and hatred are not alien to him either. Truman has lost some of his memories of his life as a human being but still retains most of his intelligence and learning as a Professor of Philosophy. Thus he essentially is an observer who ruminates on what it means to be human but can not absorb those meanings and identify with them himself, at least not as far as the more crass parts of what it means to be human. I am not sure if this is a criticism of the book. It is more of rumination on Truman and what he really is. Is he both more and less than what we are? Is he better because he has resisted the most basic urge that drives his kind and essentially has no other drives or urges that might corrupt or taint him? What would he become if he or someone he cared for was hurt or killed? Would he show anger and rage or would he be able to rise above those base emotions? For me it is something that bears consideration. This was sitting on the "new book" shelf at the library. I am kind of over zombies that aren't The Walking Dead, but figured I'd give it a shot. Not realizing this is a sequel. Bugger. The compare/contrast to new world vs old world was very interesting, po This was sitting on the "new book" shelf at the library. I am kind of over zombies that aren't The Walking Dead, but figured I'd give it a shot. Not realizing this is a sequel. Bugger. Much improved. Light on zombie action so I took a star away. By zombie action I mean threat of biting and eating. Nice fresh story with this one. Also you would think that folks would lose it over zombies with higher functions. Nope. Girl doesn’t even mention it to anyone. Milton is hardly used. Plot holes are s big problem that hold this story back from being better. Since the main reason I read books like this is to be entertained, well, I must say this one fit the bill and then some. I suppose one can't really go wrong with zombies...then again I thought the same thing about vampires once upon a time. But that's a thought best expressed elsewhere. And rather curiously there's nothing I can see on the book to indicate it is the second book in a series. I did actually wonder about that, since (a) the title seemed a bit on the cumbrous side, and (b) nobody wri Since the main reason I read books like this is to be entertained, well, I must say this one fit the bill and then some. I suppose one can't really go wrong with zombies...then again I thought the same thing about vampires once upon a time. But that's a thought best expressed elsewhere. And rather curiously there's nothing I can see on the book to indicate it is the second book in a series. I did actually wonder about that, since (a) the title seemed a bit on the cumbrous side, and (b) nobody writes just one book about vampires, werewolves, zombies, tax auditors or any of the other creatures out of a nightmare any more. Even if they make them sunshine sparkly, fallen angels or necromancer slacker artists with a drinking problem. Or to knock off the bloviating: I can report that this book works, and works quite well, as a stand-alone novel. I'll probably seek out at least the first book in the series at some point, but as of the time of this review, I've not read it and don't feel any overwhelming urge to go hunting for it. This is one you can read on its own. And enjoy. However, I couldn't quite bring myself to rate this one as five stars due to some rather strange false leads planted in the reader's head, dead ends and other miscellany of the sort that should have been caught by some blue pencil wielding editor. If such beings have not yet themselves been confined to the realm of myth. (Or nightmare, I suppose, depending upon the author.) There were also some rather surprising omissions, though these are of the sort that I'm assuming authors do not typically owe anything to readers by way of explanation. >>> First, a "false lead:" at several points in the novel it is implied that Zoey has some sort of zombie connection, and that she is somehow supposed to be some sort of savior. Nothing ever comes of this. And in a book of only 230 or so pages. Huh? >>> Second, an omission: We never find out what it is that makes Milton into the "Zombie Whisperer" (the possibly unfortunate nickname I pinned on him as I was reading along) that he obviously is. Not even a peep of speculation. As in, why do they do what he says, and more importantly, why don't they want a snack of Milton tartare? We never find out, indeed, all the characters take his special nature for granted. After the author’s impressive debut novel, DYING TO LIVE, I couldn’t wait to get my hands on its sequel (but was prevented from getting to it sooner due to my ever expanding TBR pile). LIFE SENTENCE picks up 12 years after the events of DTL. This time our survivors have cleared and fenced themselves into a large area just outside of a major city. The groups’ spiritual leader, Milton, continues to use his supernatural gift to horde the undead into holding bins; the aggressive ones go to one area, After the author’s impressive debut novel, DYING TO LIVE, I couldn’t wait to get my hands on its sequel (but was prevented from getting to it sooner due to my ever expanding TBR pile). LIFE SENTENCE picks up 12 years after the events of DTL. This time our survivors have cleared and fenced themselves into a large area just outside of a major city. The groups’ spiritual leader, Milton, continues to use his supernatural gift to horde the undead into holding bins; the aggressive ones go to one area, the seemingly less aggressive to another. When Milton’s protégé, Will, notices two zombies in the latter area behaving almost like “normal” humans, he soon befriends them. Most of the novel is told from one of the intelligent zombies’ viewpoint (we discover his name is Wade Truman, a former college professor who is slowly trying to remember his past life, and whose notes we’re now reading). He meets an undead woman named Lucy, and together they spend their days and nights writing, reading, and playing the violin (but trust me . . . this isn’t funny or cheesy in the least; Paffenroth truly develops his zombies as much as his human characters). The second storyline the novel follows is Zoey, a teenage outcast who agrees to take her “vows” to the community. She’s as deadly with a gun as she is with her wit, and eventually Will and her situations meet for a finale that’s exciting, scary, and best of all, a HUGE cut above your standard zombie fare. Paffenroth continues to explore zombies from a philosophical angle, this time bringing out the humanity of his two intelligent monsters: neither of them want to eat the living, despite it being a newfound instinct. The self-control displayed by Wade could have been a quick rip-off of “Bub” from Romero’s DAY OF THE DEAD, but being this is a novel, we get to see what’s going on inside this unique zombies’ mind, and its more caring and understanding than most of the human survivors. (Speaking of DAY, there’s one group of sleaze balls who try to ruin the party before human and zombie team up to stop them; their leader’s name is Rhodes, which I’m sure is in tribute to Romero). My only gripe is I wanted to see more of the work done by Milton, who was the driving force behind the first novel. Hopefully, if Paffenroth returns with another DYING TO LIVE, he’ll go there. Any horror fan will enjoy LIFE SENTENCE, especially those with a thing for zombies. The author’s unique perspective on a post-apocalyptic, undead world puts this—like its predecessor—in its own league. For me, this is the “To Kill A Mockingbird” of zombie stories. While the world of Zoey and Will is not as nearly as innocent or idyllic as the world of Scout and Gem, it is still a tale of growing up and discovering first hand how wondrous and terrible the world can be. And the themes of racism and “justified” killing are just as poignant. What makes this even more interesting is it is told from two separate points of view. In “Mockingbird” terms, we not only see the events unfold from the point For me, this is the “To Kill A Mockingbird” of zombie stories. While the world of Zoey and Will is not as nearly as innocent or idyllic as the world of Scout and Gem, it is still a tale of growing up and discovering first hand how wondrous and terrible the world can be. And the themes of racism and “justified” killing are just as poignant. What makes this even more interesting is it is told from two separate points of view. In “Mockingbird” terms, we not only see the events unfold from the point of view of Zoey (Scout), we also get to experience them from the perspective of Truman (a Boo Radley/Tom Robinson mix…sort of). I was excited to jump back into the world of jack, Jonah, Milton and co., and I found the book to be a very original way to reintroduce the characters and locales from the first book. I especially enjoyed the fact that it was set so far after the initial zombie outbreak. There aren’t enough good books out there that spin a successful yarn about coping long-term with a dead world. When I first realized that the book involved a “thinking” zombie, I just about threw it across the room with a cry of “Heresy!” on my lips. But Paffenroth’s siren-like prose and captivating characters brought me back and kept me glued to the pages. And speaking of covers…what the hell?!? Why is there a “Sin City-ish” silhouette of a woman holding a bleeding baked potato on the cover?!? And judging by the little pool of blood on the bottom, she also has no legs or is standing in front of an invisible table or something. The cover is so BAD I was almost embarrassed to read it in any slightly public place. Luckily, you cannot judge this book by the cover. Just create your own paper cover for it, and settle in for a tense, contemplative ride. 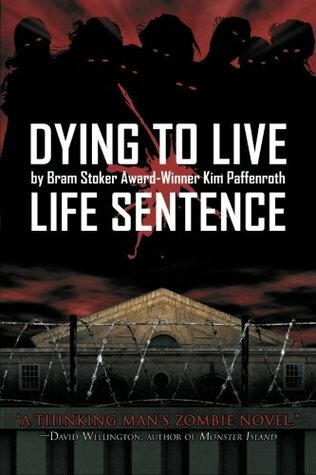 In Life Sentence, the second volume in his Dying to Live series, Kim Paffenroth continues to offer an original and thought-provoking take on the typical zombie/post-apocalyptic story. Set 12 years after the first Dying to Live novel, Life Sentence looks at the world a generation after the devastating zombie apocalypse. The book focuses on the young teenager Zoey and young adult Will (formerly known as Popcorn) and their roles in and perspective on the civilization they're a part of. It also intr In Life Sentence, the second volume in his Dying to Live series, Kim Paffenroth continues to offer an original and thought-provoking take on the typical zombie/post-apocalyptic story. Set 12 years after the first Dying to Live novel, Life Sentence looks at the world a generation after the devastating zombie apocalypse. The book focuses on the young teenager Zoey and young adult Will (formerly known as Popcorn) and their roles in and perspective on the civilization they're a part of. It also introduces some new developments in the types of zombies that still roam the countryside. Zombie 411 - For the most part, the zombies in Dying to Live: Life Sentence are your typical Romero-style walking dead, but Paffenroth serves up a new twist in the form of Truman, a zombie who is not only self-aware, but is horrified by what he and his fellow undead have done. He is joined by Lucy, another self-aware, but still quite vicious zombie, and they make an unforgettable couple. Even in the first Dying to Live novel, you could tell Paffenroth wasn't content to pen a typical post-apocalyptic tale. There was a religious subtext to that book, and beneath the surface of Life Sentence there's a heavy measure of philosophical and societal observations that gives readers a lot more to chew on (yeah, I know) than what's obvious at first. This - along with a good grasp of action, character development and pure zombie mayhem - is what sets Paffenroth apart from a very crowded pack, and what makes these books worth revisiting when so many other zombie novels seem disposable. Dying to Live, both the original and this book, the sequel, are heralded as "the intelligent man's zombie novel" and I can't think of a better description than that. The second book picks up twelve years after the first as Zoey, the baby rescued at the end of the first book, prepares to be inducted into life as an adult-in-training. Between Jack, Will (aka Popcorn) and Milton (the other zombie Christ figure) the survivors have branched out quite a bit from their initial encampment in a museum. No Dying to Live, both the original and this book, the sequel, are heralded as "the intelligent man's zombie novel" and I can't think of a better description than that. The second book picks up twelve years after the first as Zoey, the baby rescued at the end of the first book, prepares to be inducted into life as an adult-in-training. Between Jack, Will (aka Popcorn) and Milton (the other zombie Christ figure) the survivors have branched out quite a bit from their initial encampment in a museum. Now part of a prosperous town, with the zombie threat so far diminished that terror and survival has given way to a ritualistic reverence of the ambulatory dead, Zoey concentrates with precocious skill on the nature of their existence and surviving in a new kind of world. As she faces danger from zombies and other humans she slices into the nature of the people around her (dead, living and somewhere between) with a painfully keen intellect. Harder-core horror fans shouldn't be disappointed. Through the commentary on human nature there are fights, gore, moaning undead and more. There are also peculiar things happening among the dead, including a pair of zombies who seem to remember their lives before death, and who refuse to be dismissed as mere mindless creatures of hunger. Truman, once a philosophy professor, now a dead man, challenges the town's perceptions of the creatures who destroyed the world with his refusal to eat flesh and his joy of reading. And because Paffenroth himself is a shrewd flayer of human behavior, there are not-so-subtle reminders that the walking dead are far less sinister than the living who embrace cruelty and savagery. This follow-up to Mr. Kim Paffenroth's book, "Dying To Live: Life Among The Dead" is everything I could have hoped for and more. If anyone thinks the zombie genre is growing tired or that there is nothing new to offer, they obviously have not read this book. Placing the emphasis on the survivor's internal struggles (both the living AND the dead) of the world they live in, Paffenroth brings us back to our group of survivors into a climate - twelve years later - where many have never experienced a normal, civilized world. This community has adopted a very unique way of dealing with the undead. The characters here are incredibly well written and the twisting path Paffenroth takes the reader on is refreshing, thought-provoking, and utterly original. While the construction of some of the sentences seemed awkward at times, I wrote much of that off as it being part of the character's personality, whether through narration or dialogue. My only other issue was the vocabulary of one of characters who was only twelve years old. Sure, she's a smart girl, but still, using words like dexterously, ubiquity, auspicious, visceral, intuited, and denouement seem a bit much. Minor gripes aside, I encourage Mr. Paffenroth to continue his highly intelligent series. As strong as the first book was, I believe this one (Life Sentence) is even better. Even if you don't like the zombie genre, I am confident you will still love this book as much as I did. I've read A LOT of zombie novels over the years and this is at the very top of my list. I didn’t expect this book to give me much, after the fiasco with the first in the series, so i wasn’t extremely disappointed in this. The plot however was a massive let down. I have read some good zombie books which feature the plot of a zombie that can think but overall, it’s a massive overrated plot line which ruined this book for me..especially when he writing isn’t as good, and there’s literally no massive character death. When i read a zombie book, i expect there to be blood and gore because that’s what zombie books are about. I want characters that have been newly introduced, who i can get attached to, who get an arm chewed. I want a zombie book that has characters in risk of being killed by zombies. What i don’t want is a zombie book in which the only beings in the book which are inflicting pain are human thugs. I don’t want any thinking zombies, or zombies who don’t realise they are zombies, there’s no pleasure in that. Twelve years after the Undead first rose up communities have begun to spring up. This story deals with one such group and a young girl named, Zoey. Zoey is fast approaching the time when she will take her vows as a "protector" of her community. Taught to fight with various weapons and in martial arts, she also has to deal with the day to day life of survival. What if all zombies were not mindless, wanting only to eat those who are not like them. Suppose some do have memories and talents that they Twelve years after the Undead first rose up communities have begun to spring up. This story deals with one such group and a young girl named, Zoey. Zoey is fast approaching the time when she will take her vows as a "protector" of her community. Taught to fight with various weapons and in martial arts, she also has to deal with the day to day life of survival. What if all zombies were not mindless, wanting only to eat those who are not like them. Suppose some do have memories and talents that they possessed before they died. What would such an individual want and desire? Paffenroth tells the story of Zoey and the one time professor, Truman who is not one of the Undead. The story is told in stages with the journals that both keep and how they eventually come together. This is a sequel to 'Dying to Live' but can be read in isolation without losing too much as it is set 12 years later. However, I recommend you start with the first book as some of the characters feature here too. The settlement in the museum has grown since the first book and Zoey (the baby) has now reached an age where she is expected to undergo a ceremony to become an adult. A significant proportion of the book features her story, and her view of a world where zombies are considered normal. The This is a sequel to 'Dying to Live' but can be read in isolation without losing too much as it is set 12 years later. However, I recommend you start with the first book as some of the characters feature here too. The settlement in the museum has grown since the first book and Zoey (the baby) has now reached an age where she is expected to undergo a ceremony to become an adult. A significant proportion of the book features her story, and her view of a world where zombies are considered normal. The adults that remember the world before refer to concepts that she can't understand. Meanwhile Milton is still rounding up zombies rather than exterminating them. The other major part of the story features a zombie who has retained the ability to think and some of his old skills, like typing. This is a bit of a change from the first book, but is handled well and I was pleasantly surprised as I'm a bit of a purist and I hate it when authors introduce gimmicky zombies. This book started slow and so I ended up having to return it to the library unfinished. Then it took a long time for it to find its way back into my hands... my point is that this book is much better than it would seem if you look only at the fact that it took my more than 2 months to read 200 pages. I've been reading zombie novels for a little more than a year and this series is one of the best. The phrasing goes a little simple at times and the people... well, too many people who survived the z This book started slow and so I ended up having to return it to the library unfinished. Then it took a long time for it to find its way back into my hands... my point is that this book is much better than it would seem if you look only at the fact that it took my more than 2 months to read 200 pages. I've been reading zombie novels for a little more than a year and this series is one of the best. The phrasing goes a little simple at times and the people... well, too many people who survived the zombie apocalypse are really good people (but maybe it's a product of the world they live in). Anyway, those are my only complaints about an otherwise awesome book. This story is set 12 years after the zombie plague struck (unusual point #1) and half of it is told from the point of view of a zombie who is gaining some memories and skills (unusual point #2). The author does a great job weaving a story from these two viewpoints... it's interesting to see what they are both experiencing and becomes great when the storylines intersect. Satisfactory zombie novel, fascinating social commentary. Truman, The undead philosophy professor, is clearly Dr. Paffenroth's "Mary Sue" character. From his perspective, we see an interesting take on the survivors of the zombie plague -- living and otherwise. It's his insight into the human condition that makes this book work; the best parts are all from his POV. The rest of the inhabitants of this world are kind of flat, and the author doesn't take full advantage of dialogue's power to establish Satisfactory zombie novel, fascinating social commentary. Zoey, hija adoptiva de Jonah Caine (protagonista de la primera novela) cuenta en su diario una experiencia sucedida cuando tenía 12 años. Esta experiencia es la narración de uno de los veranos más especiales de su vida: El verano donde tomó su juramento. En la comunidad fundada por Milton (en la novela anterior) participan en un ritual donde identifican las leyes de la comunidad, "El defender la vida" y "Honrar a los muertos". Este verano se llena de contradicciones y reflexiones filosóficas para Zoey, hija adoptiva de Jonah Caine (protagonista de la primera novela) cuenta en su diario una experiencia sucedida cuando tenía 12 años. Esta experiencia es la narración de uno de los veranos más especiales de su vida: El verano donde tomó su juramento. Este verano se llena de contradicciones y reflexiones filosóficas para Zoey desprendidas de un ataque de foragidos y la aparición de dos zombies muy especiales. En esta segunda novela de la trilogía "Dying to Live" Paffenroth cuenta dos historias que se entrelazan al avanzar el relato. La histroria de Zoey y la historia de Truman un zombie consciente... (esperen, sigan leyendo, se que el tema de zombies con conciencia es delicado, pero den oportunidad). Part two of the Dying to Live series takes place twelve years later at the same compound. With new customs and rituals, the community has reclaimed more of the city and has secured many of the undead in a secure area. In this new era, we get to see the points of view from Zoey, who was just a baby in the first book, and an undead man named Truman, who is different than the majority of the undead. I loved this part of the series more than the first one. The storyline was more captivating and seeme Part two of the Dying to Live series takes place twelve years later at the same compound. With new customs and rituals, the community has reclaimed more of the city and has secured many of the undead in a secure area. In this new era, we get to see the points of view from Zoey, who was just a baby in the first book, and an undead man named Truman, who is different than the majority of the undead. I loved this part of the series more than the first one. The storyline was more captivating and seemed to have a bit more action than the previous book. And it was interesting to see two different perspectives in this new world, especially one who is one of the undead. I was also glad all the characters were kept in this book as well. I liked reading how each of the main characters that were mentioned in the last novel grew over the twelve year time span. And the new characters were interesting to read about as well. The only thing I didn't like was all the rules and regulations they all had to follow. I thought it was a bit much. I will begin by admitting that I was somewhat disappointed at the jump in time from the first in this series to its sequel. After the first couple pages, I was no longer disappointed and was very into this book. Two perspectives are given in this story; that of an intelligent zombie and that of a young woman looking into her past. At first, I suffered my usual level of disdain on the smart zombie idea. I will admit to bias on that subject. I have simply not liked smart zombies very much outside o I will begin by admitting that I was somewhat disappointed at the jump in time from the first in this series to its sequel. After the first couple pages, I was no longer disappointed and was very into this book. At first, I suffered my usual level of disdain on the smart zombie idea. I will admit to bias on that subject. I have simply not liked smart zombies very much outside of Cemetery Man and a couple other comedic films. Paffenroth managed to do what no other author or director has done for me in the past; put me inside of the zombie in a meaningful way. Bravo, Mr. Paffenroth! Bravo! This is not your typical zombie novel. If you're looking for gore and action, this isn't the book for you. Although I can appreciate Paffenroth's philosophical explorations (because I think the zombie genre certainly lends itself to many theories) his story is pretty far-fetched as far as zombie fiction goes. Come on, a zombie that can read or one that plays the violin??? That goes against everything I love about zombies! I think Paffenroth took a few too many liberties in exploring his thoughts This is not your typical zombie novel. If you're looking for gore and action, this isn't the book for you. Although I can appreciate Paffenroth's philosophical explorations (because I think the zombie genre certainly lends itself to many theories) his story is pretty far-fetched as far as zombie fiction goes. Come on, a zombie that can read or one that plays the violin??? That goes against everything I love about zombies! I think Paffenroth took a few too many liberties in exploring his thoughts on life, living, violence, and humanity. Although this was great, he should have stayed true to the zombie genre and its intricacies. It was too much of a stretch. I just can't do it. I am done with this book at 61%. I'm so surprised this book got so many good reviews. I read the first book and thought I'd give this one a shot. When I finished the first book, a thought "I hope the whole religious thing isn't a theme here..."
Well, I'm thinking it is. That's how it seemed to me. Quite honestly, I feel like I was tricked. I want zombies and gore. instead, I got a zombie Shephard and a lot of Bible verses. Just not what I want in a zombie book. I have to say I I just can't do it. I am done with this book at 61%. Good book. Think it was way to slow in the beginning and really did not have a climax to speak of. What it did do though was delve into the murky places no one seems to want to go ... what happens after the zombies take over the world. Paffenroth creates a people with vastly different cultures and customs that stem from where they live and what happens when zombies change and other group are combated against. It is definitely a thinking zombie mans book as you look at how people live and change. O Good book. Think it was way to slow in the beginning and really did not have a climax to speak of. I enjoyed this one also, to me it wasn't as good as the first. But to be honest it was alot different. It was more of a thriving vibe than the survival horror. They are well established now in their ever-growing community. The introduction of the Zombies getting smarter was a nice change in pace to the norm of the genre. Usually if a Zombie got smarter they became more deadly, but these two Zombies were more along the compassionate and loving side of humanity instead of the barbaric and ugly sid I enjoyed this one also, to me it wasn't as good as the first. But to be honest it was alot different. It was more of a thriving vibe than the survival horror. They are well established now in their ever-growing community. The introduction of the Zombies getting smarter was a nice change in pace to the norm of the genre. Usually if a Zombie got smarter they became more deadly, but these two Zombies were more along the compassionate and loving side of humanity instead of the barbaric and ugly side. I am currently enjoying this book. The story is equally divided into following two different sides of the post Zombie war. One side is the journal of a Zombie who seems to have retained some level of humanity, and the other is the diary of a girl coming to age within a survivor community and what this now means. Her coming of age is when she becomes part of the protectors with a responsibility to the community at large. Quite interesting. Absolutely loved this sequel to Dying to Live. This story of the survivors takes place 12 years after we left them in the last book. The story is told by Zoe, who is the baby that was rescued in the first book, as well as by Truman, a Zombie who retains the ability to read and write. Unlike the first book this one is not so much a story of survival as it is a story of hope. I really look forward to finding more work by this author as I was very impressed with his talent as a writer. I actually didn't care much for the first book, but this story was fabulous. Its unique, well paced, and grabbed my attention right away. I am so glad that I didn't skip it; I would have really missed out. The zombies were really, well, human...believable, sympathetic and really the best part of an otherwise well-written book. There are 4 characters I really still want to know more about, so I am hoping there is a third book. Really interesting. In a time when there are more varieties of zombie than there are ways to count, it was amazing to see "smart zombies" that just wanted to live somewhat normal lives. They were so close to being living humans, and the fact that they couldn't even discern the difference themselves made it easy to sympathize with them. I even forgot sometimes that I was reading the words of a zombie. And when I remembered, it made it all the more interesting. I am a professor of religious studies, and the author of several books on the Bible and theology. I grew up in New York, Virginia, and New Mexico. I attended St. John's College, Annapolis, MD (BA, 1988), Harvard Divinity School (MTS, 1990), and the University of Notre Dame (PhD, 1995). I live in upstate New York with my wife and two wonderful kids. In the horror genre, I have written Gospel of the I am a professor of religious studies, and the author of several books on the Bible and theology. I grew up in New York, Virginia, and New Mexico. I attended St. John's College, Annapolis, MD (BA, 1988), Harvard Divinity School (MTS, 1990), and the University of Notre Dame (PhD, 1995). I live in upstate New York with my wife and two wonderful kids. In the horror genre, I have written Gospel of the Living Dead: George Romero's Visions of Hell on Earth (Baylor, 2006) - WINNER, 2006 Bram Stoker Award; Dying to Live: A Novel of Life among the Undead (Permuted Press, 2007); Orpheus and the Pearl(Magus Press, 2008); and Dying to Live: Life Sentence(Permuted Press, 2008).